Why do gamblers continue to gamble when they know they will lose? Why will “what we know” hurt us more than “what we don’t know?” Why do you remember your summer vacation of 1985 differently than your brother? The Manager’s Pocket Guide to Behavioral Economics answers these questions and more while examining flaws in our thinking, our decision-making, and how thinking illusions deceive us. 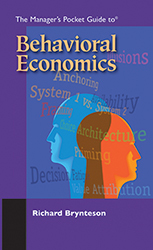 Behavioral economics is the study of cognitive, emotional and social forces on decision-making. It is a multi-faceted lens through which you can look at your own behavior and that of your employees. Ultimately, behavioral economics invites us to look at ourselves and others, and laugh. This book explores the notion that we are fallible, easily confused, not that smart and often irrational. It considers how our decisions depend upon the circumstances and upon our cognitive, emotional and social situations. According to the author, behavioral economics also offers hope, with the possibility that the more we understand the dynamics of our choice making, the better off we are. Each chapter includes experiments which led to the findings discussed, contributions of leading theorists in the field, a “Try This” box that suggests how to apply the research and “Learning Points” which summarize the chapter.